7 Seas Whale Watch is located in the heart of historic downtown Gloucester, MA and in one of the busiest parts of Gloucester harbor. As soon as you board the Privateer you will be surrounded by the sights and sounds of Gloucester’s working waterfront. You may see fishing boats that have just returned from sea unloading fish, lobstermen baiting and setting their traps, and perhaps even some of our indigenous wildlife such as Harbor seals, Gray seals, Common eiders (a beautiful sea duck common in the harbor), Double-crested cormorants, and of course you will hear the ubiquitous “seagulls” (mostly Herring, Great black-backed, and Ring-billed gulls). Shortly before leaving the dock your naturalist will give a short presentation to familiarize you with the area that we will be visiting (Stellwagen bank National Marine Sanctuary) and the whale and other wildlife species we are likely to encounter while on the ocean. After the naturalist’s “dock talk” it’s time to cast off the mooring lines and get underway. As we make our way through the harbor your naturalist will point out the historic buildings and landmarks of Gloucester and tell some of the maritime lore surrounding this world famous seaport. First, we will sail past the Cape Pond Ice company where you may see fishing boats loading up with tons of fresh-water crushed ice that is used to keep the fish that they catch very cold and fresh on the long trip home to Gloucester. You will the US coast Guard station, the Gloucester Sea Jacket Marine Paint Factory (a nationally registered historic landmark that is now the home of 7 Seas partners Ocean Alliance), Ten-pound Island, Hammond Castle, Eastern Point Lighthouse and the Dog Bar Breakwater and get commanding views of Gloucester’s skyline. 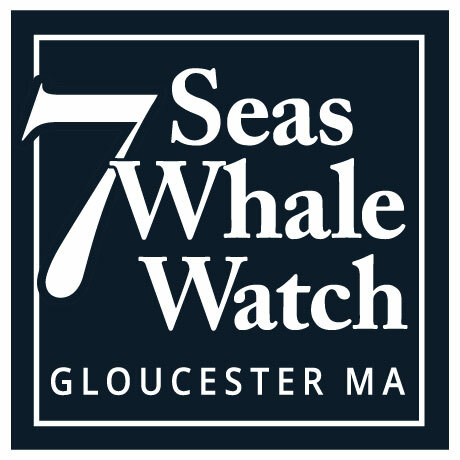 As we head out to see the whales, a narrated tour of Gloucester’s historic harbor is an important element of every 7 Sea’s Whale Watch. After passing the Dog Bar breakwater at the harbor’s entrance we will begin making our way off-shore. The exact direction that we travel depends, of course, on where we expect to find the greatest concentration of whales. Our experienced captains (the most experienced whale watch captains on Cape Ann with over 60 years of combined whale watching experience) will take into account all variables (weather and sea conditions, where whales have been sighted recently, reports from fishing vessels already on the water, etc) to make sure you see the best of what your particular day on the water has to offer. The trip out to the whales usually takes between 45 minutes to a little over an hour depending on the location of the whales. Remember that you will be traveling aboard the PRIVATEER IV: the newest and the most comfortable high-speed whale watching vessel in Gloucester and we trust that your trip out the whale’s feeding ground will be an enjoyable part of your trip. Once we arrive on the feeding grounds we will spend approximately 1.5 hours with the whales. Your onboard naturalist will provide valuable insight into the lives of the whales you see and explain the behaviors you observe the whales engaged in. Our experienced team of naturalists and the information they impart during your time with the whales will greatly add to your whale watching experience and hopefully give you a deeper appreciation of the whales you see and the unique marine environment that we are ALL so privileged to be visiting. While at times all of the whales are concentrated in one area (indicating that area is heavily laden with fish) at other times the whales may be more spread out. We DO NOT simply stop on the first whales we see and watch them for the entire trip! We make every effort to visit with many different whales (and different species of whales) to show you as much as possible during your time on the water. It is important to remember that going on a whale watch is a lot like going on a safari. The animals that we see are not captive animals in the confines of a zoo or an aquarium, nor are they trained to perform “tricks” for our amusement. They are WILD and often ENDANGERED animals that are free to roam the ocean at will. This means that they may move many miles in the course of a day as they seek out the most productive areas of the ocean to feed. Thus we never know exactly where they will be, what species we will see, or what activities they will be engaged in. The unpredictability of the trip is part of the fun! Given the productivity of the region and the fact that we have seen whales on OVER 99% of our whale watches during the past 30+ years, chances are very good that you will see whales! After our time with the whales has ended we will begin our journey a back to Gloucester. During the trip home your naturalist will be available to help answer any questions you may have about the whales or their environment or to expand upon any of the topics discussed while viewing the whales. Again, our naturalists are the most experienced in Gloucester and have studied whales not just here in New England, but also in Alaska, Antarctica, Hawaii, Florida, Australia and New Zealand! Please take advantage of the opportunity to learn directly from some of the most knowledgeable whale biologists in the world. We hope that this description of what a whale watch with 7 Seas entails has whetted your appetite for whale watching. Visitors to Gloucester have the rare opportunity to visit with some of the rarest animals on Earth in their natural habitat. It is an experience not to be missed and sure to be a highlight of your New England vacation!